GN Solids Control has provided thousands sets of decanter centrifuges since the beginning of GN Solids Control opening. As one of the largest solids control and waste management equipment providers, GN Solids Control centrifuges are widely using in many countries to separate water from solids. Last year, GN Solids Control provided one set of containerized centrifuge treating system for a Singapore client. This centrifuge treating system is also equipped with GN flocculent system. The centrifuge and the flocculent system are all put in one 40ft container. GN Solids Control also provides decanter centrifuges in this special structure for Canada and Russia which are most suitable for cold winter. This special design is also easy to move if customer has several different work sites. Here is the centrifuge is 22 inch size rotating bowl, model GNLW553-VFD. It's fixed on the top layer, while the flocculent system is fixed on the bottom layer in order to save room. As we know, centrifuge is usually used to separate solids larger than 2~5microns, with the help of flocculent system, most of those finer solids less than 2~5microns can be separated out. GN Solids Control provides one screw pump to pump the slurry into decanter centrifuge, and the flocculent is feed into decanter centrifuge as well. 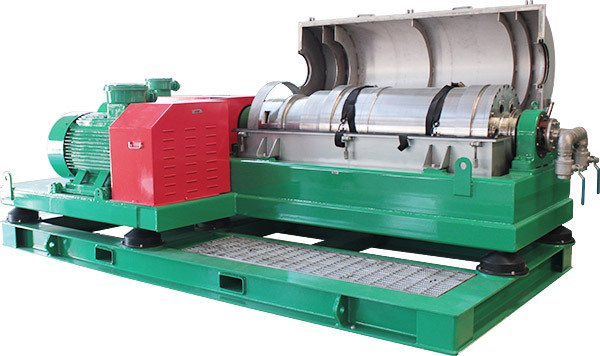 GN decanter centrifuge is lubricated automatically. One set of screw conveyor is fixed under the centrifuge discharge port so large solids can be transported. While during moving, the centrifuge screw conveyor can be collected and put inside the container for fast moving. GN Solids Control provides 9inch, 14inch, 18inch and 30inch centrifuge besides the 22inch. Different size centrifuges can be used to treat slurry from different industries. GN Solids Control also keeps centrifuges stocking in GN Houston warehouse, welcome to visit GN Solids America LLC if you are looking for the most cost-effective centrifuge.